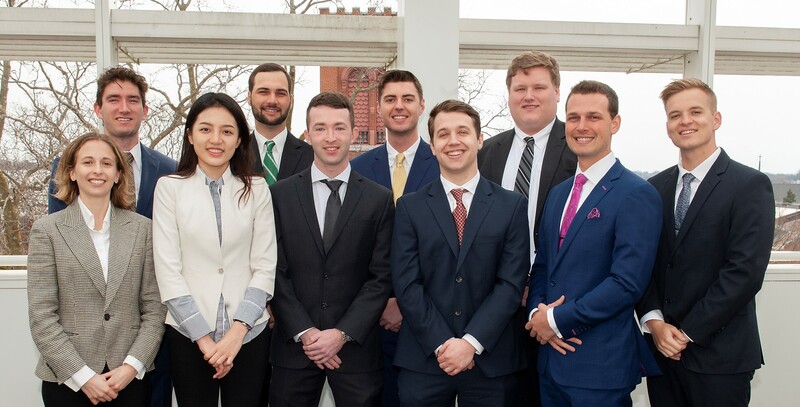 The Henry Fund is an endowed equity portfolio managed by select Master of Finance students in the Applied Securities Management program at the University of Iowa’s Tippie College of Business. Our Fund targets US-traded companies that are industry leaders with above-average investment potential. Front (left to right): Elisa Suarez Gil, Ziyi Zhang, Ryan Wallen, Matthew Hubbell. Austin Hassett, Zach Geerdes. Back: Mark Newman, Jackson Smith, Trenton Savage-Warren, Matthew Detweiler. Each analyst specializes in one of 11 economic sectors. Team members are responsible for analyzing current holdings, identifying potential opportunities, implementing control systems, and monitoring the Fund’s performance. Analysts also deliver semi-annual presentations to an independent advisory board of financial professionals, which oversees all investment decisions of the Fund.